Another very successful Easter Pike Angling Competition concluded yesterday evening, sorry for the delay with the results, it was late when we finished up last night. 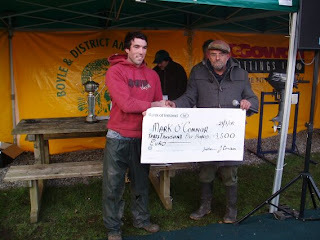 1st prize went to local man Mark O'Connor for the biggest pike of the event, weighing 25lbs. 15oz, he received the prestigious Moonstone Jewellers Perpetual Cup and €3500. 2nd prize of €2500 went to Tony Egan for a fish weighing 22lbs. 10oz. 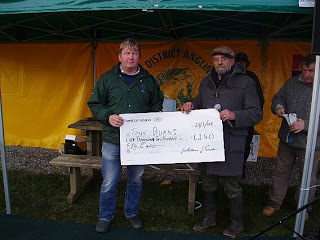 3rd prize- €1250 went to Tony Burns for a pike weighing 21lbs. 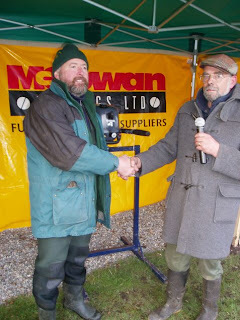 This years special Club members prize of a 4hp 4-stroke Yamaha engine went to Local Angler Francis McGlynn for his fish weighing 18lbs 8 oz. Runner up on the Club members section was Prionsias McGee for a fish weighing 7lbs 10 oz. 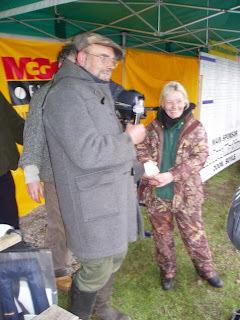 The Ladies section was won by Sharon Diggins for her pike of 6lbs 12oz. 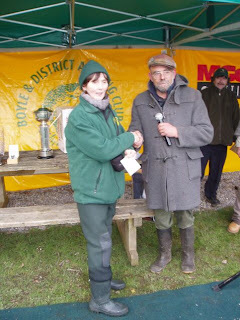 Followed in 2nd place by Jane Suffin who caught a pike weighing 6lbs. 5oz. 3rd was Ann McGlynn for her pike weighing 4 lbs. 1st Emer Beirne, for a pike of 12lbs. 2nd Gary Nicholson for a pike of 3lbs. 5oz. A joint 3rd place went to young anglers Ben Geoghegan and Joe Egan, who both caught fish weighing 1lbs. 8oz each. 6 other great day prizes, each valued at €200 were also handed out. 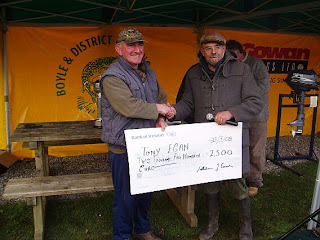 Once again, Boyle & District Angling Club would like to Thank everybody involved in the Sponsorship, setting-up and running of this great event. It cannot be said often enough, that without the help and all hands on it wouldn't work. The first day of the competition is over now and I think we could say that it went pretty well. The weather held up great and apart from the strong & cold northerly wind it was a nice bright day. Heaviest pike caught by Mark o'Connor, 25lbs 15 oz. 2nd Tony Egan with a pike weighing 22lbs. 10 oz. 3rd Francis McGlynn, 18lbs. 8 oz. 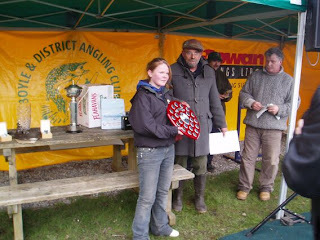 Leading for the Club members prize at the moment is Emer Beirne with a pike weighing 12lbs. 8 oz. Leading the Junior section is Gary Nicholson with a fish of 3lbs. 12 oz. In the lead for the Ladies section is Sharon Diggins with a fish of over 6lbs. All weights mentioned here are subject to final checking of weighing cards by the club. Well Done everybody so far, and let's hope that tomorrow goes equally well or better! A Big Thank you to everybody involved in the Sponsorship, setting-up and running of this great event. It cannot be said often enough, that without the help and all hands on it wouldn't work. We will see you all again in the morning and wish participants Tight Lines once again! Easter Pike Angling Festival Tomorrow! We are only a day away now from this years Easter Pike Angling Festival on Lough Key, and for the first time in years it looks as though the weather isn't going to be very cooperative. Two rather wintry days are forecasted, but we are hoping that it will be reasonably o.k. Here is a reminder about the check in times for the weekend. In order to ensure a smooth start, please try to be there early. This years Easter Pike Angling Festival is now only a few days away. Let's hope that the weather will be kind again. We could really do with a good dry week leading up to the event, to allow the water levels to drop a bit. I hope everybody got safely through St. Patrick's weekend. I think it's fair to say we had a good weekend here in Boyle and our entry in this years Parade was quite successfull, as it landed us the overall 2nd prize again. Boyle & District Angling Club would like to wish everybody a very Happy St. Patrick's Day! Hope to see you at the Parade in Boyle today. Enjoy your day!! Once again we will hold our annual Easter Pike Angling Festival, taking place as usual at Lough Key on the Easter weekend, Sat. 22nd and Sun. 23rd of March 2008.
plus six consolation prizes valued each at around € 200. Special prize to win a 4hp, 4-stroke Yamaha outboard engine! Only paid up members will qualify for this section. Anyone wishing to become a member of the club should contact one of the Committee menbers below. Cost €35 for the year. We also have a Junior section again, with € 200 waiting for the winner of this section plus Boyle & District Angling Club Perpetual Shield. Ladies Section: € 300 plus valuable Ladies Prize! 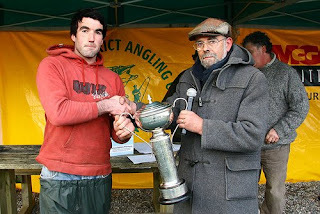 Entry Fee: €60 per Angler for the two days, regardless of age. Full list of competition rules available on request, and will be handed out at the event. Sunday: Check in 9.30 at the Doon Shore, Lough Key, Start at 10am Finish at 5pm. East Bros. Machinery in Conjunction with Yamaha Ltd.
We would like to thank all our sponsors for their help, as with out them this event would not be possible. We are looking forward to seeing you all once again at this great event!!! 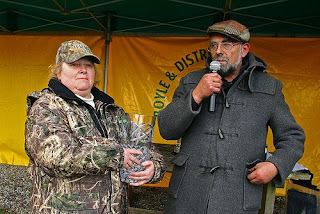 Boyle & District Angling Club goes online! 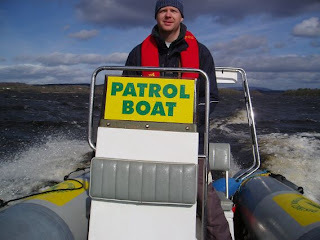 Welcome to Boyle & District Angling Clubs newly set up blog. This is the official portal for all Club news, upcoming events, competition results and more... Watch this Space!! !